Objective : To bring in the potential of every Rotarian to support the success of fellow Rotarians by giving and receiving business worldwide. 2. 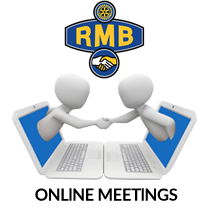 You will be informed about next online meeting in the group. Register for the meetings. 3. Attend the meeting, ask any questions, give or take referrals from fellow Rotarians and get connected. Note : If you want to be one of the speaker in upcoming meetings, contact the group admins in a private message. Estimados, un placer estar presente en estas reuniones de trabajo y compañerismo y fomentar el ideario con el que nace nuestra agrupación, Rotary. Excellent initiative. Kudos to you all for this improvement. Congratulations for this initiative! We need mor options to Connect. Its a great challenge! Online meeting initiative is a good one and can add a new dimension to the Rotary movement. Looking forward to participating.